We have the webs largest selection of dependable commercial grade low voltage UL Listed LED Strip Lights for both indoor and outdoor lighting applications. We stock a variety of well-made tape lights in all kelvin temperatures as well as an extensive range of lumen outputs to choose from. Use our high quality LED strips for interior and exterior lighting areas where long lasting, eco-friendly and customizable linear illumination is needed. Trusted 3M backing tape is mounted on every strip and ensures long lasting adhesion to any clean, dry, and smooth surface. All of our low voltage Ribbon Star tape light rolls are hand tested, rated for 50,000 lifetime hours and have a 2 year warranty. Browse our selection of premier RGB, RGBW, and Single Color strips below or give us a call with any questions that you have to determine which strip is best for your project. Our Megalux LED Strip light uses a 2835 size surface mount chip on a 10-12mm wide PC board to create ridiculously bright illumination for linear applications. This product is best for task lighting or areas requiring large amounts of lumen output. Due to its high operating temperature we recommend using a metal heat sink. Ribbon Star Supreme is a go to choice for industry professionals who demand an extremely bright UL listed low voltage light strip. The densely spaced 3014 LED chips on a 10mm wide PC board create a beautiful line of light effect using our aluminum extrusions with extra frosted covers. Our easily concealable ThinLux and SlimLux LED strip is so small that it can be installed in the width of a common saw blade groove. The ThinLux LED Light Strip measures a mere 3.5mm wide while the SlimLux is 5mm, making them perfect for furniture designs, architectural applications, stages, homes and business lighting. The double wide peel and stick LED tape has two rows of 3528 LEDs to create perfect illumination in our wider aluminum channels and frosted cover varieties. 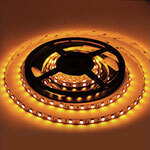 Create custom drywall and ceiling fixtures with the combination of these wider 16mm ribbon lights and Klus channels. 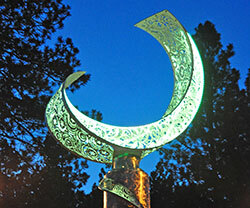 Our Ribbon Star Ultra flexible lighting has been our rock solid choice for any indoor or outdoor lighting application. With a high lumen output and reasonable power draw this strip is a no brainer for any project that will last for years to come. Available in both uncoated and TPU coated IP68 weatherproof styles. Our premium RGBW strip lights can display all of the vibrant colors of an RGB light but also have a fourth color output of either cool or warm white. This lets you choose any desirable light color along with a true white or warm white light to customize your lighting for any mood or special event. 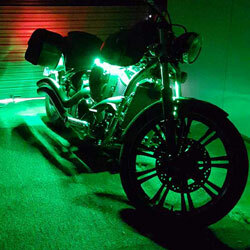 We have the webs largest selection of indoor and outdoor RGB strip lights to display millions of vibrant color choices. 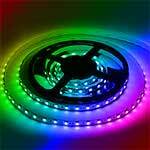 Our RGB Strips are the brightest and most dependable UL listed RGBs on the market. 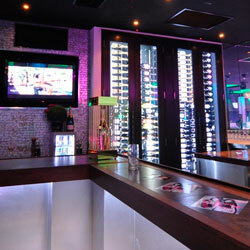 We have the best color changing strip lights for the most demanding lighting professionals. 5050 are the most commonly known type of LED chip and measure 5mm x 5mm in dimension. The larger chip size provides bright and vivid lighting for any lighting situation. Our 5050 strips are UL Listed and can be used for multiple indoor or outdoor projects. Our Max Ribbon Lights are the ideal product for illuminating a handful of interior and exterior spaces. 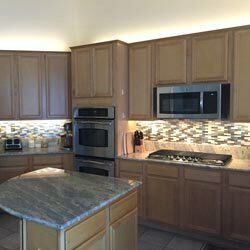 From backyard patios to under cabinet kitchens these economical LED strip lights can be used anywhere and provide ample lumens, low power consumption and a 30ft maximum serial connection. Side emitting LEDs shine horizontally as opposed to vertically, like most common LED strip lights. 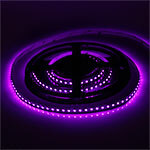 This allows the led strip light to be used in small spaces, around curves, window seals, counter tops, and bar tops. 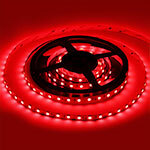 The bendable Flex LED strip has a specially designed PC board made for bending and flexing around corners and curves. Unlike other linear LEDs which can't be bent horizontally this ribbon can be folded, bent, and twisted to conform to any installation. 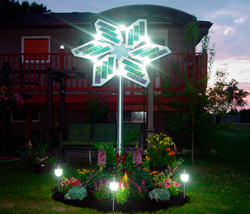 Ribbon Star is the original linear light strip from Ecolocity LED and is our most basic type of LED Ribbon. 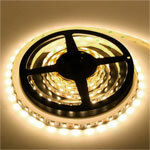 This LED strip light is an ideal choice for accent and ambient lighting projects. Requiring a mere 1.46W per foot this strip is low power, low heat, with considerable lumen output. 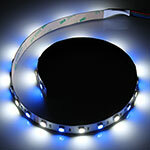 Our Ribbon Star Extreme Indoor and Outdoor LEDs are a low power, high brightness, weatherproof led strip that can be connected in a maximum serial connection up to 100ft. 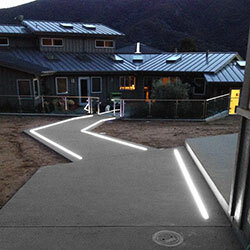 The waterproof and UV resistant coating makes this strip ideal for outdoor landscape and architectural lighting jobs. Based on the area being illuminated choose the color, brightness, and linear footage of the LED strip light you want for your project. Be aware that some of the higher output strips require a heat sink when mounting. Once you have chosen your strip, multiply the watts per foot by the linear footage of your project. This will give you your max power load and the size of power source that you will need. 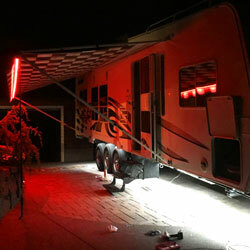 Before permanently mounting the strip light we recommend you unroll it from its reel and test it. You can use masking tape to tack it into place. Be sure that it is the strip you want before permanent installation. Depending on the size of your project wiring can be very simple or a bit more complicated. Soldering is the best option for long term projects but we also have a large variety of quick connectors and jumper cables. 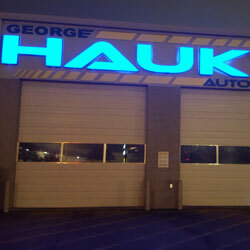 If you want a more professional and finished install we offer a huge selection and are a trusted vendor of KLUS aluminum strip light channels. With special mounting options these extrusions really add to the look of your lighting project. Once you have decided that the strip is suffice for your plan. 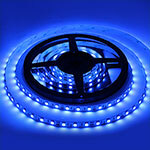 You can then, cut, re-wire, peel, stick and mount the LED strip lights to any clean and dry surface. 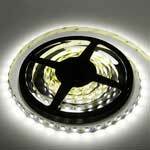 There are so many indoor and outdoor lighting possibilities using our low voltage LED strips. Our single color LEDs can be dimmed using our PWM dimmers or Dimmable Power Supplies. When using our RGB or RGBW strip lights one of our color controllers is necessary for dimming and color changing functions.